When you think of February, what’s the first thing that comes to mind? It’s most likely not President’s Day. However, I bet you’re thinking about love, hearts and boxes of candy, that’s right—good ‘ol Valentine’s Day. With only 23 days, a few hours, and even less seconds till the big day, give or take when you read this blog, it’s time to start planning your Valentine’s campaign, creating buzz, and executing your plan. In this blog, we’re going to walk you through how you can market your services on a day that is heavily focused on consumer goods. Step 1: Plan Your Campaign – If you haven’t already started planning your Valentine’s Day themed campaign, don’t worry, you still have time! When it comes to planning your campaign, we recommend you start by identifying a compelling offer. This could be something as simple as half off teeth whitening or $0 down on Invisalign with $79 a month. Once you’ve established your offer, you need to identify all the marketing channels you’re going to use to promote your offer. Pay-Per-Click (PPC) – If you’ve never done a PPC campaign before this could be the perfect time to try it. This will cost you some money but can help you promote your offer to the top of Google and/or Bing’s search engines, ultimately helping increase your exposure. Once you’ve established the marketing channels you’ll use, it’s time to map out your calendar. 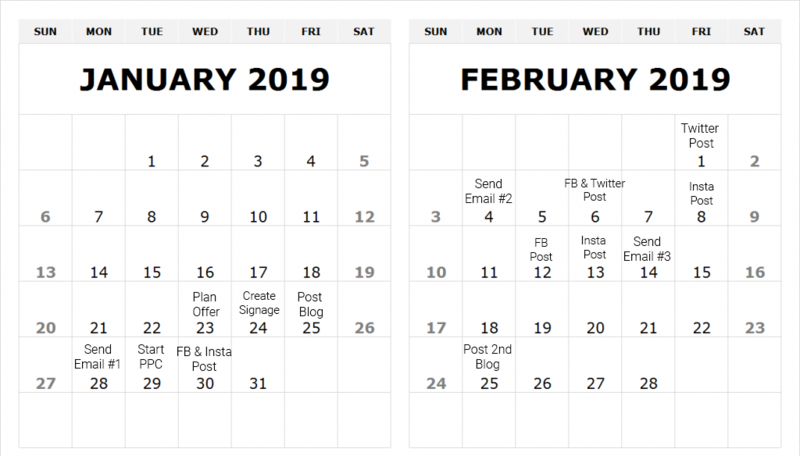 On this calendar, you should identify on what date and time you plan to post, send and/or share your content. Step 2: Time to Create Buzz – Now that you’ve crafted your campaign calendar, you’ll need to start getting the word out. Per the example calendar above, we recommend you start your campaign off by posting a blog with background information about why your patients need your service. At the bottom of the blog, have a call-to-action (CTA) for your spectacular offer, like encouraging them to contact you for more information. One you’ve posted this blog, you are ready to craft your first email. Be Light Hearted – Valentine’s Day is all about gushing about love and being cute. 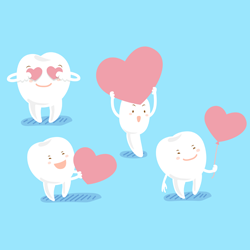 In this initial email, I recommend using a pun in the graphic header, such as, “The Tooth is We Love You”, “Be Sweet To Your Teeth”, or “Love the Gums Your With”. Then in the body of the email, write a bit of copy about your offer, and include a button that links them to your blog where they can learn more about your Valentine’s Day offer! Craft a Unique Subject Line – A subject line can make or break your email campaign. It’s important to always A/B test your subject lines. Leading with the exclusive offer in the subject line can be a great way to get patients to open your email. Another option would be to bait them with a question that peaks their interest. Send at the Right Time – In a recent marketing study, from HubSpot and MailChimp, they state sending on a Tuesday or Thursday between 10AM-11AM is the best time to send your targeted email. Keep in mind this isn’t a universal truth. We recommend testing various emails at different times and seeing what works for you and your practice based on the best results. Create Social Graphics – Make 3-4 different graphics that highlight and discuss your Valentine’s Day offer. Use those graphics to post on social media! Email Marketing – Craft two more email campaigns to drive home your campaign. Make sure to continue to test, send at the right time, and be daring with your subject lines. Signage – Create a sign that can be framed and put on your front desk highlighting your Valentine’s Day offer. Another way to promote your offer is to print out cards that you can put in patients to-go bags that highlight the offer. Blog – Once your campaign is complete, write another blog about the success of your campaign. You can do this by asking for a patients testimonial, with their permission of course! Using a patient as an example of someone who took advantage of your offer and had success with it can encourage folks to utilize your services in the future or not miss your next offer. Pay-Per-Click (PPC) – If you’re interested in learning more about PPC, we encourage you to check out this blog about PPC basics. Now that you’ve followed our three-step plan to executing a Valentine’s Day marketing campaign, we encourage you to repeat, repeat, repeat! This type of campaign can be replicated for other holidays such as St. Patrick’s Day, 4th of July, Labor Day, Tree Day, or it can be the base for other monthly marketing campaigns. Always remember that creating content that ties everything together across all of your marketing channels can help to increase the number of patients and prospective patients who seek your services.